John Ford, though a man of a prickly and mercurial nature, was a director with great artistic vision and critical and popular success. Despite his laudatory career and multiple awards it took many years for the stars to align for Ford's pet project, a film based on Maurice Walsh's 1935 short story The Quiet Man. It may have been due to timing or casting. Perhaps the failure of studio executives to see any box office in the slight story or understand Ford's vision of expressing his lead character's nostalgic yearning and his journey through a mix of humour, mythology and Irish literary tradition. Whatever the hurdles, the path was finally cleared by the man Ford befriended, bullied and made a star, John Wayne. Wayne was at this time making his first steps into production with Angel and the Badman and The Fighting Kentuckian at Republic Studios when he broached the idea of The Quiet Man to Herbert Yates. Yates immediately saw the prestige of having a Ford picture under the Republic banner, but wanted a buffer against the possibility of box office failure. The Quiet Man and its Irish location shooting was approved if, first, John Ford gave the studio a western. As the publicity poster proclaimed he gave them "John Ford's Greatest Romantic Triumph!". Rio Grande is at its core a story about healing, the coming together of a broken couple, a broken family and a broken country. Based on a Saturday Evening Post story by James Warner Bellah (Fort Apache, The Man Who Shot Liberty Valance) with a screenplay by James Kevin McGuinness (Tarzan and His Mate, Arsene Lupin Returns) Rio Grande is set at an isolated cavalry outpost in the southwest where Colonel Kirby Yorke, played by John Wayne, contends with raiding Apaches who escape U.S. authorities by crossing over the Rio Grande/Rio Bravo into Mexico. York's superior, General Philip Sheridan, played with a gruff professionalism by J. Carroll Naish (Sahara, A Medal for Benny) gives Kirby a covert order to disobey the rules and at the next opportunity pursue the Apaches into the neighbouring country. It is an impossible mission where Yorke's actions will be condemned by the very people who gave them. Sheridan: "If you fail, I assure you members of your court martial will be the men who rode with us at Shenandoah." Sheridan, Yorke and burly Sgt. Quincannon played by Victor McLaglen (The Informer, Gunga Din) share a bond which reaches back to their service in the Civil War when their activities on behalf of the Union caused a rift between Kirby Yorke and his southern-born wife, Kathleen. 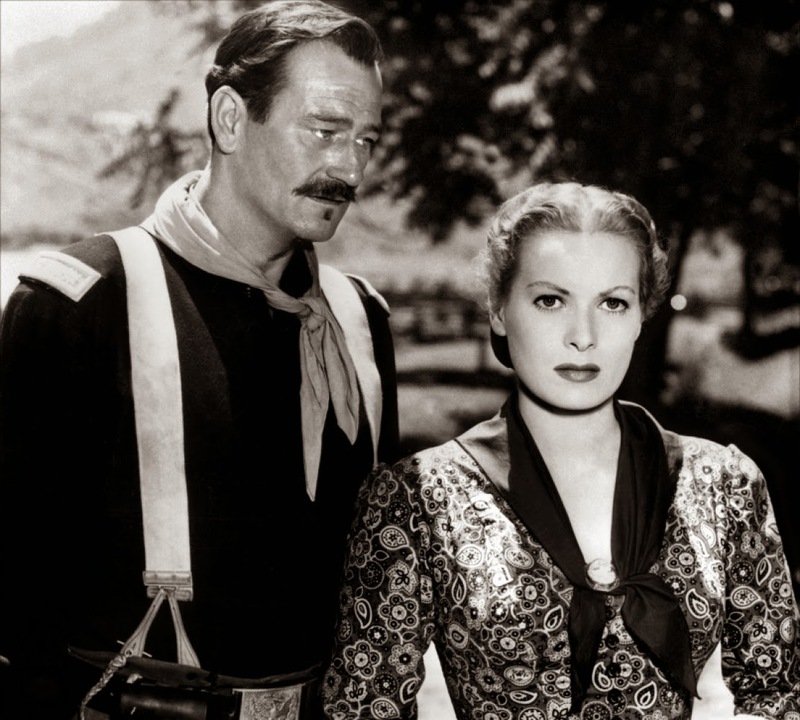 Maureen O'Hara (Miracle on 34th Street, The Black Swan) plays the tempestuous Kathleen Yorke. For the first time movie audiences were treated to the electric chemistry and unique friendship that made Duke and Miss O'Hara one of Hollywood's most enduring screen teams. 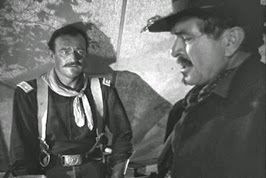 The beauty of our stars and the stark location of the film is enhanced by the black and white cinematography of Bert Glennon, Oscar-nominated for Stagecoach, Drums Along the Mohawk and Dive Bomber. Jeff: "I'm not on this post to call you father." 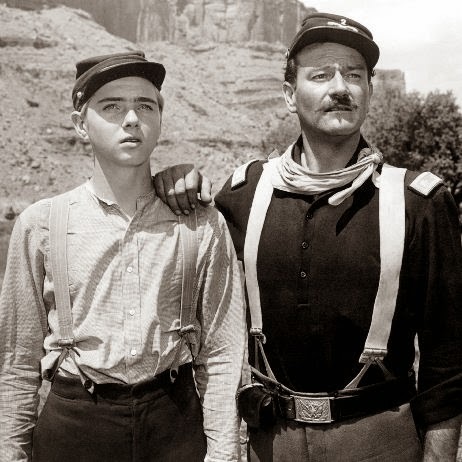 Among recruits new to this frontier posting is Jefferson Yorke, the teenaged son of Kathleen and Kirby, played by Claude Jarmin Jr. (The Yearling, Intruder in the Dust, Hangman's Knot). Failing in mathematics at West Point, "Jeff" enlisted and finds himself face-to-face with the father he has never known due to his parent's long separation. Ben Johnson, Harry Carey Jr., Claude Jarmin Jr.
Sandy: "He said he was the teacher's pet of a chowder-headed mick sergeant. What's that mean, doc?" Kirby Yorke is pleased to meet the son who is following in his footsteps and flustered at how to handle the uncommon role of a father. Jeff is a good kid who does his best and makes friends easily. Those friends include Trooper Travis Tyree played with an appealing grace and ease by Ben Johnson (Wagon Master, Shane, The Last Picture Show) and the affable Trooper Sandy Boone played by Harry Carey Jr. (Red River, Three Godfathers, TVs The Adventures of Spin and Marty). A highlight of the film is a display by these three actors of Roman Riding with the riders standing on more than one horse and jumping. The trick riding is at the behest of Sgt. Quincannon who acts as an "uncle" toward Trooper Yorke. 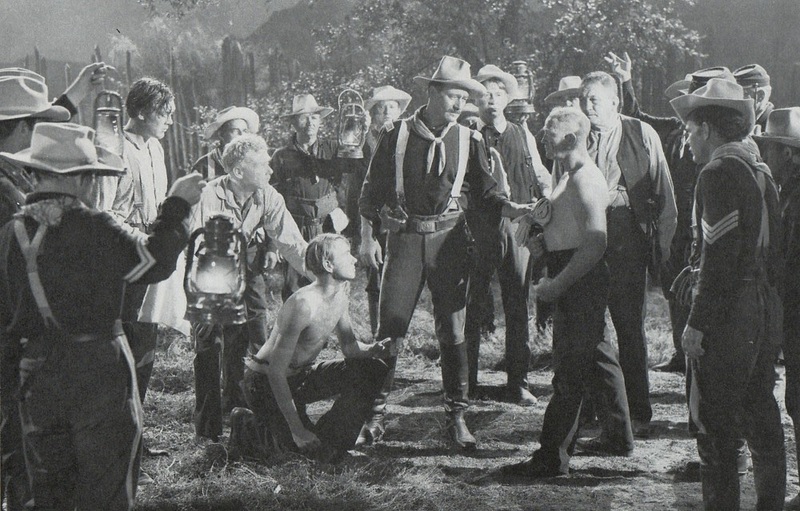 The seeming favouritism leads to a fight between Jeff and Trooper Heinz. Heinz is a lovely and memorable role for stuntman Fred Kennedy, who had been in films since 1938s The Adventures of Robin Hood and worked with Ford on many occasions. Tragically, Kennedy would be killed performing a routine stunt on 1959s The Horse Soldiers. Kathleen: "Ramrod, wreckage and ruin, still the same Kirby Yorke." Kirby: "Special privileges to special born, still the same Kathleen." The routine of the post and its commander's defences are assaulted by the arrival of Kathleen Yorke, determined to purchase Jeff's release from the army. The attraction between Kirby and Kathleen is as undeniable as their clinging to past grievances and stubborn refusal to understand the other's point of view. Will proximity, hardship and the example of their maturing son be enough to bring the couple together. Perhaps music will soften their hearts. Victor Young's (Shane, Around the World in Eighty Days) score is very fine and a personal favourite of mine. The soundtrack is filled with songs by Stan Jones such as the lovely My Gal is Purple, and Dale Evans' peppy Aha, San Antone. The familiar tunes I'll Take You Home Again, Kathleen and Down by the Glenside may not be appropriate to the time of the story, but are certainly appropriate to the tone of the film. The songs are beautifully sung by the regimental singers aka the Sons of the Pioneers in cavalry guise, with the soulful Ken Curtis taking lead vocals. One of the things I like best about Ford's cinematic storytelling is that he brings us into a fully formed world such as the society of the post in Rio Grande. A look between characters, an attitude or a cryptic remark infers a back story for the imaginative viewer. There's a novel behind those looks that pass among Kirby and his officers. Anticipating a hard winter of campaigning, the women and children, including 10-year-old Karolyn Grimes (It's a Wonderful Life, The Bishop's Wife, Blue Skies) and 11-year-old Patrick Wayne (Sinbad and the Eye of the Tiger, Young Guns) are to be transferred to safety at Fort Bliss. When the children are captured in a raid and taken across the border, volunteer troopers Tyree, Boone and Yorke take the lead in a dangerous mission to bring the children home safely to their anxious parents. The theme of reunification is amplified once again in Rio Grande. Rio Grande has it all - action, drama, romance, humour, songs and riding "after the manner of the ancient Romans". 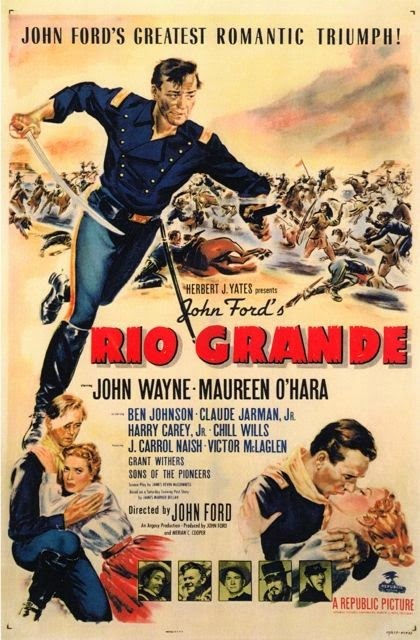 TCM is screening Rio Grande on Wednesday, April 23rd at 10:45 am, as John Wayne is April's Star of the Month with wall-to-wall Duke playing on the network from Monday, April 21st to Friday, April 25th. Sounds like any five days at my house! One of my favourite John Ford pictures. Remember when I was really, really young and called it "the one with the kid'? The way you describe Ben Johnson is so true- "played with appealing grace and ease". I love your way with words! Thanks a lot, Miss McC. "The one with the kid" indeed. It could be nothing else. Perhaps a more mature young man than either of his parents. When I was young and foolish, I thought this was one, while good, was the lesser of the three cavalry movies. But as I've gotten older it does hold a special resonance for me. I think its a wonderful film and one of Wayne's most underrated performances. That roman riding sequence is still one of the greatest things I've ever seen. It's that way with some movies, isn't it? We grow with them or they grow with us. Harry Carey Jr. write in "In the Company of Heroes" of how he and even Ben trained for that Roman Riding and young Claude Jarmin just jumped right on and away he went. Ah, youth. I'm petitioning TCM to call John Wayne SOM Week "Five Days at Caftan Woman's House." I think this will catch on enormously. I heartily approve. It sounds like a party! "There's a novel behind those looks that pass among Kirby and his officers." You are very astute! That same observation can also be applied to characters in other Ford films. I haven't seen RIO GRANDE in awhile, so I look forward to watching it again. In addition to be on TCM, it's also available on Amazon Prime. One of my great draws to Ford is that in his cinematic storytelling he trusts the audience. We don't need every little thing spelled out for us. We can see what's going on through the characters interactions. It makes me feel like part of the process. I'm sure you'll enjoy the re-watch. I always do. I love this: "A look between characters, an attitude or a cryptic remark infers a back story for the imaginative viewer. There's a novel behind those looks that pass among Kirby and his officers." Packing now to head over for Five Days at Caftan Woman's House. The new TCMFF? Yes indeedy. This the place. We're in with the in crowd. I'll put the kettle on and clear the cats off the couch. I'm pretty sure I've seen this, but honestly, I get all those 'Rio' movies mixed up - Rio Grande, Rio Bravo, Rio Lobo, etc. I know I did see 'Fort Apache' and 'She Wore a Yellow Ribbon,' though. Shh. Don't tell anybody, but there was a time when I would mix up my "Rio's" as well. And I call myself a fan. How embarrassing. It's the only one in black & white so that helped work them out in my mind. Rio Grande gets some love with a beautifully written review! As I mentioned over at Ivan's all of these westerns on TCM in April. My dad is going to be thrilled and my mom will get a reprieve from Gene Autry 24/7. Hi, Page. Appreciate the compliment. Some say the secret to a happy marriage is compromise, I say it's two television sets! I am certainly a sucker for any John Ford, John Wayne or Maureen O'Hara film, so you can imagine how much I enjoy revisiting this one. It is a perfectly blended, highly entertaining, absolutely amazing film. Thanks for the reminder that it has been too long. Too long a time passes between my time spent watching "Rio Grande", but like a cherished friend it is always there waiting. I highly approve of this choice. For starters, anything with the Sons of the Pioneers in it....but all the way around, this is my favorite Western movie. I've always thought it felt more real than either of the other two cavalry films, from the way it looks to the story itself. And that gorgeous theme music, which amazingly is never heard beyond the credits (except one brief quote after the first raid scene), and for some reason has never, to my knowledge, been recorded again! I also appreciated your observation about the untold backstories in Ford films. Maybe I never really caught onto that in Rio Grande until lately because I'd been watching it since I was a kid and took a lot of it for granted, but I really noticed the same thing when I saw They Were Expendable for the first time a few months ago. We're told practically nothing about any of the characters, but the little scraps we are shown set our minds spinning trying to imagine who they are and where they come from. The very second I hear the opening to the score for "Rio Grande" I get a happy-sad feeling. This film was a particular favourite of my dad's, and I think each of us four sisters feel it is "our" special movie. I truly feel that the way Ford presents his characters and their stories makes it impossible not to continually find things always fresh no matter how many times we watch his movies. It makes me very happy to know you are such a fan. Sons of the Pioneers forever!